Running numbers: 1361 - 1365. Built: 1910 to lot number 179. This class of attractive little tank engines were built to work around the Plymouth and Weymouth docks as their wheelbase was just 11 feet in length, easily negotiating curves of 2 chains, or 66 feet, in radius. The story of their design is that a roll of old drawings of the Cornwall Railway '1391' class were given to Harry Holcroft in 1909, then Assistant to the Chief Mechanical Engineer. 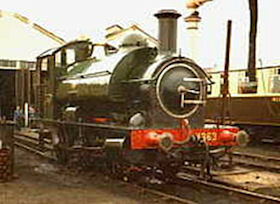 His brief was to design an 0-6-0 saddle tank similar to the old class but using modern locomotive practices. A roomy, covered cab with large windows front and rear was provided and the small 16 inch diameter cylinders were inclined, one of only a few classes to have this feature. Valve gear was also carried over from the earlier design in the use of the Allan gear. 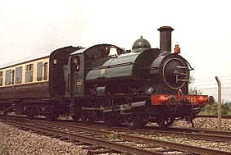 The only alteration to the class was the fitting of a larger chimney so that the top of the chimney was 4½ inches higher than the cab roof. Sadly all five examples were withdrawn in 1961 and 1962 with the onset of diesel shunters. One example escaped from the cutter's torch, number 1363.